Haygood Memorial Methodist Church is an amazingly hospitable place. Please help us extend that hospitality by volunteering to welcome people outside the doors of the church on Sunday mornings. Greeters are tasked with welcoming people to the church as they enter the building. A greeter is different than an usher. Our wonderful usher team is tasked to welcome people on the inside of the sanctuary with bulletins and smiles. They have other responsibilities during the service including taking up the offering. A greeter’s primary focus is to welcome people outside the doors of the church. Here’s why serving as a greeter could make a huge impact and be part of God’s kingdom plan. First, greeters bring a spirit of cheerfulness to our membership. In Psalm 122:1, the Psalmist sings, “I was glad when they said to me, ‘Let us go to the house of the Lord.’” We want people on Sunday morning when they wake up to think the same thought. If you’re life is like mine, many Sunday mornings can feel rushed and hurried and chaotic. It will make a huge difference when you pull into the parking lot to see a smiling face. Greeters send the message, ‘We’re glad you’re here. We realize it was not easy to get the kids fed and dressed. We realized you could be doing chores that you couldn’t get done throughout the week with your hectic schedules, but it will be worth it to be in the house of the Lord.” It’s a sign of welcome to our members. 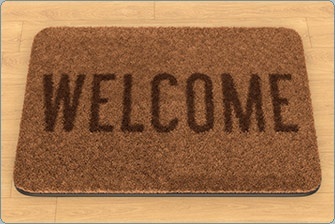 Secondly, greeters help newcomers have a good first impression of the church. Do you remember what it’s like to visit a church for the first time? You’re not sure how to get to the sanctuary. You have no clue where the nursery is. For some people, the biggest question is, ‘where’s the coffee?’ Greeters can provide directions and cut down on the disorientation that often goes along with being a first-time guests. What about you? Would you be willing to help serve as a greeter on a rotating basis? There will be two greeter stations from 9:45am-10:15am and again from 10:40 am-11:10am. You can choose which time-slot works for you here.